Racquel Natasha is an extremely popular fashion and lifestyle blogger who is loved by fashion enthusiasts around the world. Famous for her breathtaking photos and refreshing posts, Racquel has certainly managed to make quite a name for herself as one of the ultimate authorities on all things to do with fashion, beauty, lifestyle, skin care and travel. In an article titled “Pampered by OROGOLD”, Racquel talks about diamonds, a girl’s best friend, and her efforts to preserve her youthful looks by lathering ingredients like diamonds, pearls and caviar on her face. Racquel starts off her review by stressing on the importance of a proper skin care regimen, particularly during the summer months, when the skin needs some love and care the most. She describes OROGOLD Cosmetics as a luxury, high-end line that is spread over 17 countries and specializes in anti-aging skin care. She further says that OROGOLD has 10 different collections for every type of skin that one can imagine. Racquel also raves about the OROGOLD VIP facial which left her skin glowing and feeling hydrated for days after. Racquel explains that before the facial an OROGOLD specialist briefed her on her skin concerns and inspected her skin to offer a complete insight about any problems that she might have. She was told that a CyrogeniC facial would be the best for her particular needs, something which had a procedure that is quite similar to microdermabrasion. Her favorite part of the facial was when the specialist applied the 24K CyrogeniC Liquefying Pearl on her face, a formula that starts its journey as a powder and evolves into a liquid once it touches your skin. Racquel says that the powerful antioxidants in this product left her skin feeling visibly radiant right after. She ends her OROGOLD review by mentioning that she was recommended our 24K Vitamin C Collection and also offers a list of the OROGOLD products that she is currently using in her skin care regimen. 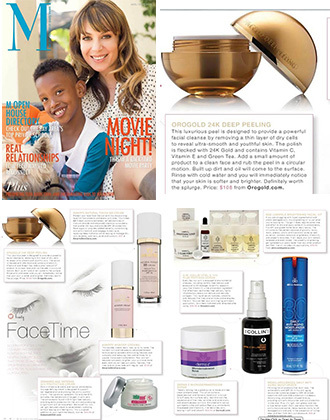 OROGOLD is delighted to see this beautiful review on our VIP facial and our product lines. We would like to thank Racquel for her refreshing review, and some more for those extremely beautiful photographs, which also made our own photography experts glow with joy. Customers wanting to try out this luxe facial or any of the products mentioned by Racquel in her OROGOLD review can always walk into our nearest store for complimentary demonstrations and expert recommendations.